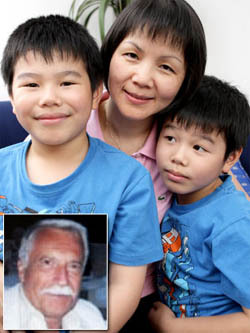 FOR almost 30 years, French ship's captain Andre Vallerian has kept a photo in the lounge room of his Marseille home of two Vietnamese children he saved at sea. And for those three decades, Thi Luong, just 12 at the time of her rescue, and her family in Sydney and Paris have been searching for their hero to say thank you. Now they have found Captain Vallerian, who won a commendation from the French Government for his actions, and are bringing him to Australia to meet the boat people he saved. Thi and seven of her family fled Vietnam in 1980 in the most perilous journey of their lives. After the fall of Saigon in 1975 and an escape which took five years to arrange, they were at sea on a rickety fishing boat with 120 others. The family made a pact: they would survive or die together. For 13 harrowing days and nights they floated on the ocean without food or drink. Five children died of starvation, the women were kidnapped and raped by pirates and older passengers were robbed of jewellery and gold they needed to pay for their escape. "The pirates separated the men and the women and took all females into rooms on their boat - my mother smeared dirt on her face for camouflage so they wouldn't take her," Thi said from her home in Bankstown yesterday. "On another boat the people ate human flesh to stay alive, my uncle told me. Our aim was to reach land, any land that was not Vietnam or communist." After almost two weeks came deliverance for Thi and the boat, immobilised after the pirates disabled its engine. They were rescued by passing cargo ship the Tourville, skippered by Mr Vallerian. They were taken to a Thai refugee camp where they waited four months to be sponsored for a new life in a new country. "The French Government took care of us and the others who had no sponsor," Thi said. Her parents settled in a northern suburb of Paris until 15 years ago when Thi migrated to Australia and married her husband Kien. They now have two Aussie kids - twins Anson and Jonathan, 8, who attend Bankstown Public School. "Somehow my eldest brother managed to find a copy of a picture with the name of the cargo ship," Thi said. "My sister Phoebe spent a lot of time searching online and through the French official marine archives. "Finally after 29 years she found Andre - he is now close to 70." Thi said only people who had experienced similar dangers could really relate to the plight of modern-day asylum seekers. "I do feel sympathy for (the Sri Lankan) asylum seekers because of the experiences I had," she said. "But it's a difficult situation for the Government and everyone." Mr Vallerian and his wife will fly into Sydney on November 15 with Thi's parents, Be and Thu Luong, and her sister Phoebe. "Our guest humbly doesn't want to take credit for doing his job - we offered to pay for his flight to Australia but he refused," Thi said. "We owe our lives to him and his crew. We are where we are today because of them."